I thought part 5 would be the last post of the series, but as it turns out, I’ve had to split it into two due to its length. On this occasion I’d like to talk about marketing, a word that makes many translators cringe. Selling oneself – it may sound too direct, but that’s exactly what businesses have to do – isn’t easy at all. For some people it may feel arrogant and forced; others don’t really know how to do it. Reading blogs and books on the subject, talking with colleagues, and even finding help from a professional marketer are all ways to come up with ideas to promote your services. These are the things I’ve learned during my first one and a half years as a full-time translator. Your brand must be found consistently on your website, your business cards and other marketing collateral, your social media profiles, etc. 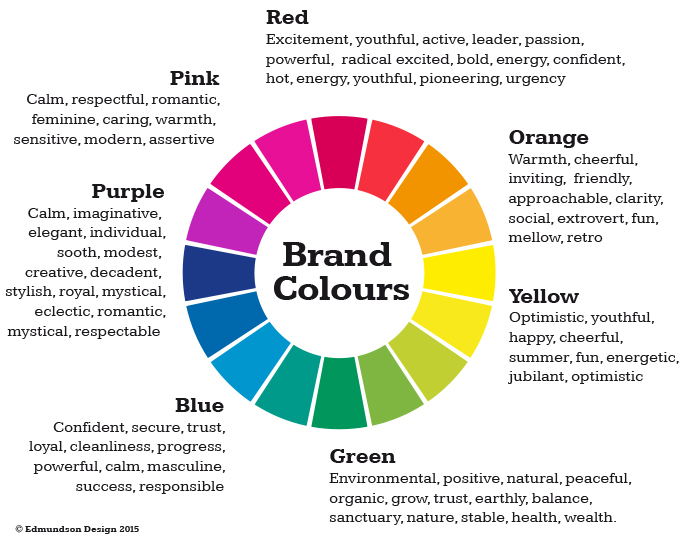 It’s helpful to have an idea of what each colour represents so they transmit your voice clearly. I’ve heard that a logo/brand should have no more than two colours; I guess it makes sense, right? You want to send a clear message, so using the whole palette may lead to confusion. Think of a logo that represents you well. 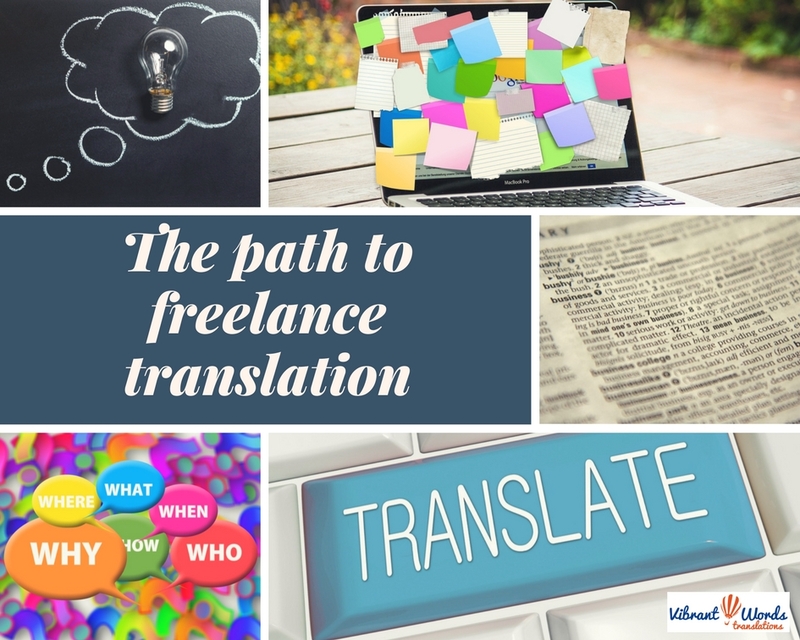 Most translation businesses have a globe or something of the like, which makes sense, but it’s hard to make it memorable any more. Think of the fields you work in, maybe, or something about you that can be turned into an image. In my case, after a lot of thinking, it just sprang to mind one night. A hot air balloon means adventure and travels, and as a result, languages and cultures. It speaks to me for different reasons and it’s a figure that has sneaked into my life in secretive ways at different times – something I only realised after I chose it as my logo. So the answer had been in front of me for a long time, I just didn’t know it! I asked a designer and artist friend of mine if he could capture my brand’s brief in a hot air balloon, and that’s how it happened. There are many websites where you can have a logo designed for as little or as much money as you please. You just have to do a search and the results will be overwhelming. b) USPs: Does it sound familiar? It stands for ‘Unique Selling Points’ or ‘Unique Selling Propositions’, and they are what you have to find out about yourself so you can exploit them in your marketing collateral. What makes you different from other translators? Why should a client choose you? It’s not so easy, let me tell you, but there is a ton of information out there to help you figure it out: books, blog posts, webinars, podcasts… Having a look at other people’s websites or LinkedIn profiles can help you get some ideas, too. So, for example, if you were a lawyer in a previous life and you’re offering your services as a translator now, a valuable USP would be your first-hand experience in the legal sector. If you specialise in a rare field, that probably makes you unique, hence more valuable. If you have lived – or still live – in a country where your source language is spoken, you surely have a better understanding of the culture than someone who’s never lived there, so that’s a USP, too. c) CV: You can find better information about translators’ CVs online and in books, so I’ll be brief. A caveat: don’t forget to make your language pair(s) visible! Yes, yes, it sounds ridiculous, but many project managers complain about this happening way too often. Tailor it for each job/agency as much as possible. You should even adapt your specialisations; for example, if you’re applying to an agency which doesn’t offer one of your fields, remove it because it’s sort of pointless. If they refer to ‘education’ as ‘training’, then stick to their terminology. Also, localise it for each country, e.g. US vs UK (-ise vs -ize; programme vs program). Don’t send your CV to direct clients; it’s better if you refer them to your website or your LinkedIn profile. If you’d like to send them something, opt for a visual infographic explaining who you are and how you can help them. d) Social networks: This is very obvious, but I’ll still devote a few lines to this 21st century miracle for those of us who work from a home cave, aka as a home office. As a professional translator, LinkedIn is indispensable, especially if you don’t have your own website. Use the professionally taken headshot I mentioned in part 2 (LINK), work hard on a clear description of who you are and what services you offer, and complete the profile as much as possible. Bear in mind that the first few sentences of your description will show under your picture and basic info, so make them count. If someone looks at your profile, those two or three lines should already give them a clear idea of who you are. I find the sections at the bottom extremely useful: languages, publications, courses, certificates, etc. It’s another version of your CV, so make sure you keep it updated! Once your profile is looking good, it’s time to connect with people. Please, please, please, add a personal message to your invitation. Say hi and why you’d like to connect, especially if you haven’t met them personally. You represent your brand (you are your brand, actually), and every little detail counts. You don’t want to come off as rude or detached, do you? Luckily enough, translators are polyglots, which means we can have our LinkedIn profile in more than one language. Take advantage, as this will make you easier to find! Twitter is the other social network I use actively for professional purposes. I had never used it until I created my VibrantWords Translations account and, I must say, I’m positively surprised. If you follow the right people, you can learn tons! 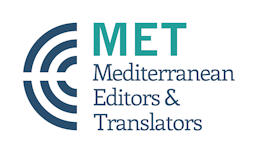 I learn new Spanish words every day, and I’ve come across interesting events and articles thanks to other translators or the associations I follow. I’ve found, however, that sometimes it poses a challenge: how often should you tweet? How can you constantly find interesting things to share? Some people seem to be on Twitter 24/7, so you might feel the pressure sometimes. The key? Figure out the best way for you to use it, without letting what others post – or how often – get to you. No time to find content? Then retweeting is your best friend! Make sure you become familiar with translation hashtags, although I would advise against using too many in a single post. As for Facebook, I entertained the idea of creating a business page, but I haven’t done it yet, and I don’t see it happening any time soon. Instagram? The little bit I use it is for personal purposes only, so no room for VibrantWords Translations there for now. e) Email signature: I mentioned this in passing under the IT section. Once you have your professional domain email address, you need to have a signature that is automatically inserted at the bottom. Include your name + postnominals (BA, MA, PhD, MCIL, etc. 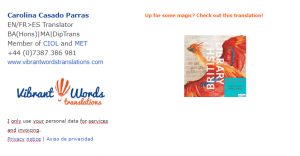 ), your job title (eg DE-EN Translator & Proofreader), phone number, website, and even links or icons to your social profiles. If you’ve got a logo, that’s a great place to put it, too. And if you don’t, you can add the logos of the professional associations you belong to linking to your profiles there. You can also use your signature to link to one of your translations or writing samples. As you can see, I’ve done that in mine, and I change it as I see fit. Since 25 May, 2018, acknowledging GDPR in your email signature is a good idea, too. And that’s it for now. In the next post, I’ll talk about business cards, online visibility and having your own website, among others. So, what can you share about your marketing strategies? How do you promote your services?